Two posts in one day - I've gone crazy LOL. 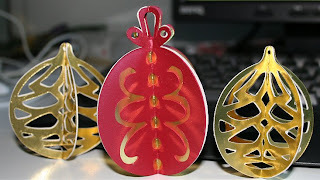 This one is of some 3D xmas baubles I have made on my PI, the middle gold & red metallic one was made with a file made by the lovely Alisa http://www.de-signsmadebyme.com.au/ - the other plain gold ones were a flat 2D file from UK Scrappers that I converted to WPC, tweaked to make it mirror image & then made into 3D. The gold ones were cut on some scrap cardstock that a lady named Loraine from our cutting group gave me - thank you Loraine!